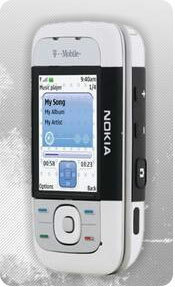 The Nokia 5300 XpressMusic phone, which features a stylish slider design and can hold up to 1,500 music tracks, keeps the focus on advanced music portability. With dedicated external music keys, stereo Bluetooth, and a memory card slot supporting up to 2 GB of memory, the 5300 offers a comprehensive feature set at an accessible price. Never before has it been as easy or affordable for consumers to own a mobile phone that also offers a first-rate music experience that compares favorably to any stand-alone music player. Other key features include a QVGA display, speakerphone, a 1.3-megapixel camera, EDGE data support, and flashlight. It's the perfect companion to T-Mobile service. It also supports T-Mobile's great myFaves service. Now you can bring your music and communications with you--all in one place. See it in action (requires Flash). Music controls right where you need them. A 1.3-megapixel camera on the back kicks the fun up a notch. The 5300's slider design features a large display that sports an impressive 240 x 320 resolution and support for over 200,000 colors. Even with the slider closed, the 5300 features great music and call control. There are music control keys on the left side and volume adjustment keys on right side of the phone, while a stylish five-way center button resides just below the display. Slide the phone open to reveal its easy to use backlit keypad. The phone's 1.3-megapixel camera lens is discreetly housed on the left edge of the phone. A built-in mini-USB 2.0 port is provided, as well as Bluetooth stereo headset compatibility. The built-in hot-swappable microSD memory expansion slot is compatible with cards up to 2 GB of capacity. The 5300 supports polyphonic ringtones, as well as MP3-based ringers so you can load your favorite sound effects and music clips to alert you of incoming calls. Plus, with the phone's picture and ringer ID functions, you can assign pictures and ringtones to your most common callers. For when you need to be discreet, there's also a vibrate ringer mode. Meanwhile, voice activated dialing makes calling your friends, family, and associates as easy as saying their names. 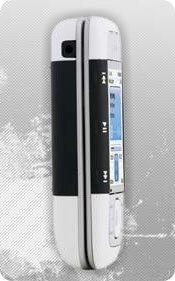 The 5300's built-in contacts list and phone book will keep track of all your contacts with its ample storage capacity. Lastly, there's an integrated speakerphone for talking hands-free, and the phone's Bluetooth connectivity means that your favorite Bluetooth headset is fully compatible (for music listening, you can still use your favorite wired headphones with the Nokia 2.5mm AV connector, sold separately). Other calling features include compatibility with T-Mobile's myFaves service, which allows you to call up to five of your most common contacts--on any network, even landlines--without using any of your minutes. Learn more about myFaves. The 5300 is a mobile messaging and Internet powerhouse. With support for the MMS (multimedia messaging service), the phone can send picture and text messages, and when coupled with the phone's powerful camera, MMS opens up great opportunities for robust messaging. The phone ships with a built-in email client that supports POP3, IMAP, and SMTP protocols. Getting on the Internet is easy with the 5300. It supports the GPRS data protocol, as well as the high-speed EDGE wireless data service. When used with your carrier data plan and the phone's USB or Bluetooth data capability, the phone can be used as a wireless modem for laptops and PDAs. The phone is bundled with a mobile Web browser, too, offering hearty Web browsing abilities right on the phone. Meanwhile, T9 text entry, a technology that makes it easier for people to enter words and text on handsets, is built into the unit--a plus for mobile email and text messaging users. The 5300 supports PC synchronization via USB or Bluetooth, which means you can manage and synchronize contacts, calendar and other data with your PC. Nokia's PC Suite application makes this process a breeze. A number of handy software tools are bundled with the 5300 including a voice memo recorder, a calculator, a calendar, a to-do list, and an alarm clock. The Nokia 5300 can hold over 100 albums worth of music (approximately 1500 tracks) on a 2 GB microSD card. Thanks to dedicated music keys, you can easily control the playback of music while simultaneously enjoying other functions such as texting, browsing, or taking pictures. For an even louder groove, you can plug in your favorite headphones or external speakers with a 3.5mm headset jack by simply connecting them to the 5300 using the inbox adapter. The 5300 can swiftly transfer albums and music collections to and from a PC using a standard micro USB connector or Bluetooth. When traveling, you can use the Nokia Wireless Audio Gateway (sold separately) to stream music collections and favorite playlists wirelessly to any supported stereo from the 5300. No one-hit wonder, the Nokia 5300 also comes with the latest messaging functions complemented by a 1.3-megapixel camera. The camera features a selftimer, an 8x digital zoom, and can be used to capture video and view video playback. You can even view video playback in landscape mode, and the volume keys double as zoom keys when the camera mode is activated. And don't forget about the games! The phone supports Java gameplay and other Java-based applications. The 5300 also sports an airplane mode feature, which allows the user to safely use the non-wireless functions of a phone (such as music, games, or organizer functions) on an airplane during flight. 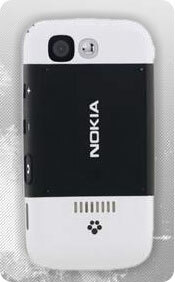 The Nokia 5300 weighs 3.76 ounces and measures 3.64 x 1.90 x .81 inches. Its lithium-ion battery is rated at up to 3.20 hours of digital talk time, up to 223 hours of digital standby time, and up to 12 hours of music playback time. It runs on the GSM/GPRS/EDGE 900/1800/1900 frequencies. The phone comes with a one year limited warranty. Featuring a music player that can play on wireless stereo headphones and with looks as cool as the music you listen to, the Nokia 5300 XpressMusic is the perfect marriage of music and style. Slides open to reveal the keypad, slides closed to prevent accidental dialing. Bought this one for my wife during our contract renewal. We have been loyal customers to our carrier since 1999. Very first month phone starting to act up. T-mobile renewed it. The second phone was not better either. Not the best phone...at all! For the first three months that I had the phone, everything was fine. But after three months, the volume just completely died! The alarm, the ring, the music player, everything. Now the sound works sometimes (it took three weeks for it to start working again and that was totally at random, nothing I did), but it's off and on. Sometimes it's quiet, sometimes it goes in and out while it's ringing, sometimes normal, and sometimes just dead. And it's frustrating to not have external ringing volume control, although holding down the pound key will switch between silent and normal. Another problem is I could not get the voice activated controls to work. I'm sure they do, I just couldn't figure it out, and I've never had trouble using voice activated controls with any other phone I've had. Another problem I've had is that sometimes even when I have a signal, a call will just end for no reason. Granted sometimes I do accidentally hit the end call button, which is of course not a problem with the phone, but sometimes there is honestly no reason for it. Also, it has a pretty short battery life, so if that bothers you I recommend a Motorola as they tend to have long battery life (although be warned, in my experience Motorola phones tend to freeze and also do not typically have the signal quality of other phones). Another problem I've recently had with this phone is that the games on my phone stopped functioning properly. Also, this phone doesn't have as much memory as I would like, so that was disappointing. But fortunately it does have a micro SD card slot, and mine came with a card already in it. Finally, as for my phone background, whenever I try to use a picture I took myself as the wallpaper, it doesn't show up as "full screen" which is what the phone calls right side up. If there's a way to do it, I haven't found it! The pluses are that the external controls for the music player and radio are nice, although it'd be nice if you didn't have to plug in your headphones to listen to the radio. The stereo headset that came with the phone was nice too. The buttons were easy to use, and I like using this phone for texting.